Donna worried about going on the stand, but Louis told her everything was fine and she would not be going on it. She then asked Louis to prepare her just in case but he did not want to hear about it. 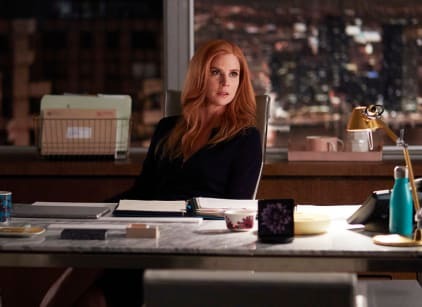 Donna was called to the stand and Andy essentially said that she slept her way to the COO position and that she would destroy evidence if given the chance. In the end, Harvey and Mike found out he gave Haley Cromwell a file to use against them. The case was thrown out, but Andy then got Jessica in trouble for helping Mike and she lost. Jessica returned and said she was ready to move on and that her name was to be taken off the door. Rachel and Robert eventually managed to get justice for their relative who died several years before thanks to Arthur. Rachel convinced the board to let him go and she got three times the settlement for them. Donna finally kissed Harvey to let him know she was into him.